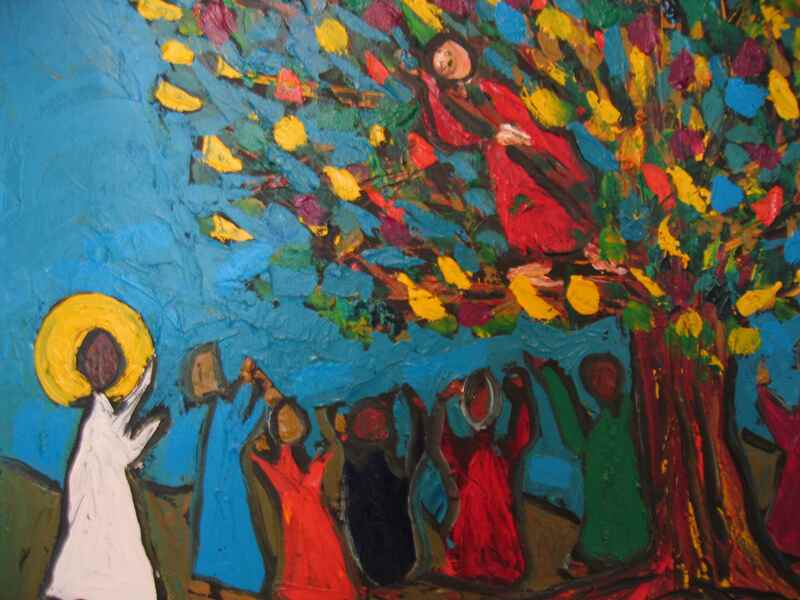 This painting of the famous Biblical scene (Zacchaeus climbs a tree to catch a glimpse of Jesus) is possibly my favorite Bible story of all time. Hmm. There aren’t a ton of Biblical stories I actually *love* but this one is special, religious context aside. My friend, Joel Whitehead, painted it and gifted this incredible piece of work to me. Every time I stop and look at it, I am stunned. If there were a fire in my house, I think this would be the first thing I grab. I love it. I love seeing it my home. I’d go visit in a museum, where, incidentally, most of Joel’s paintings belong. This entry was posted on Monday, November 27th, 2006 at 6:08 pm	and is filed under Photos. You can follow any responses to this entry through the RSS 2.0 feed. You can leave a response, or trackback from your own site. Is there anyway to get a print of this beautiful work on Zacchaeus? I’m afraid I do not have prints available to mail. I’ve been approached regularly by church groups who would like to use this image, asking me permission for use. In the end, after we’ve worked something out, they have downloaded the high resolution image on my site and created their own prints.